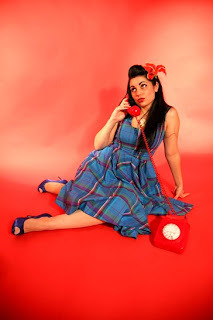 Inspector Marmalade's Notepad: Say Hello to Lilly..
My sister-in-law Lilly Von Pink is a fantastic jewellery designer, pin-up and all round lover of all things rockabilly! She also runs Burlesque nights with her sassy snappy friend Betty Bee called the Cherry Lounge, please check them out as they have some awesome stuff and frankly I don't know why I haven't blogged about them sooner! You to me pinky lea!